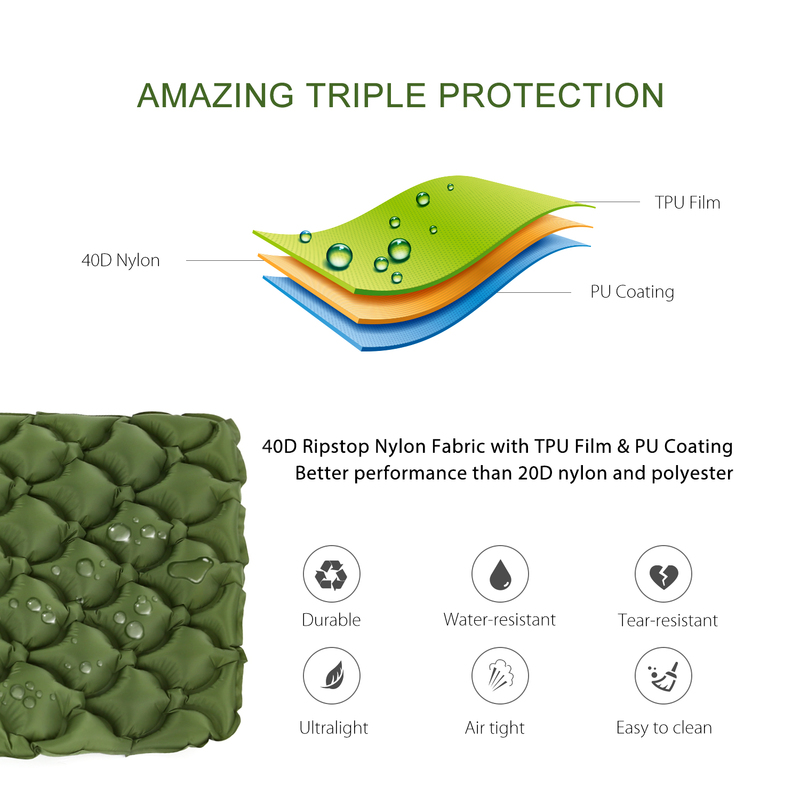 This sleeping pad is made of 40D ripstop nylon fabric with TPU lamination and PU coating, tear-resistant, water-resistant and durable. 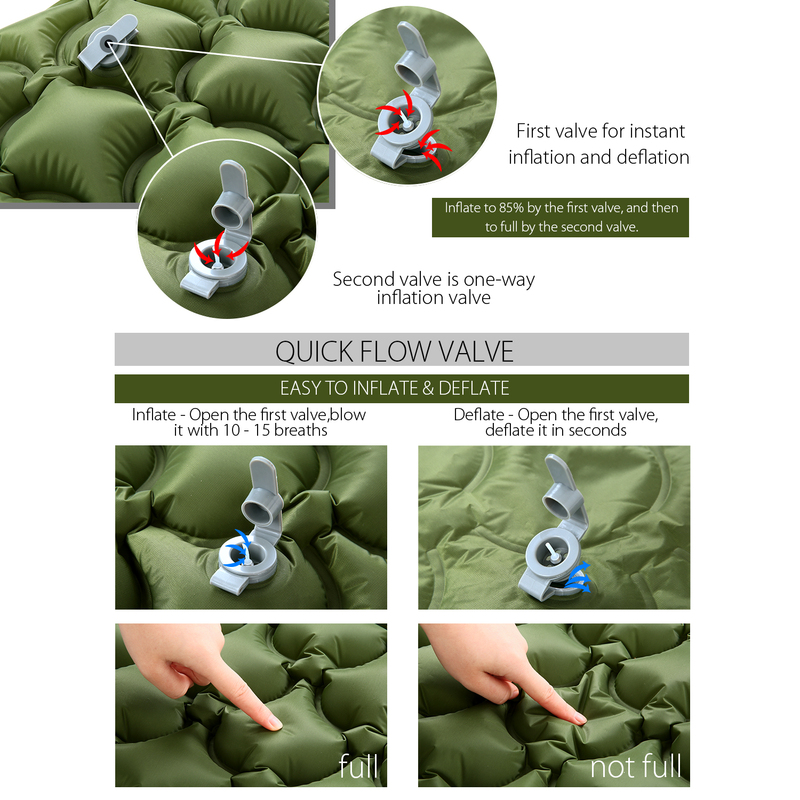 With a quick flow valve, you can inflate the pad with just 10 – 15 breaths, while the deflation only takes a few seconds. 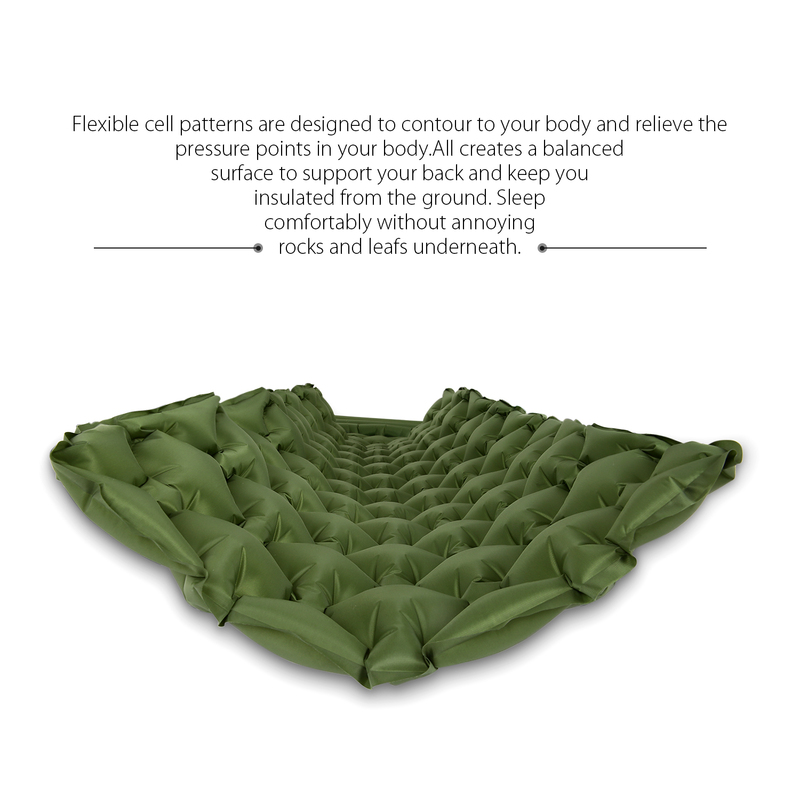 The inflated pad features special engineered cell patterns that contour to human body and provide a comfortable, balanced support for your back. With built-in pillow, you can have a good sleep without buying extra pillow or worrying about pillow slipping away. Its flexible structure also fits perfectly in a chair or a hammock, under/inside your sleeping bag, so you can pursue a cozy leisure life even outside. Pack the lightweight deflated pad in the storage sack and stuff it in your backpack to set out a brand new journey. 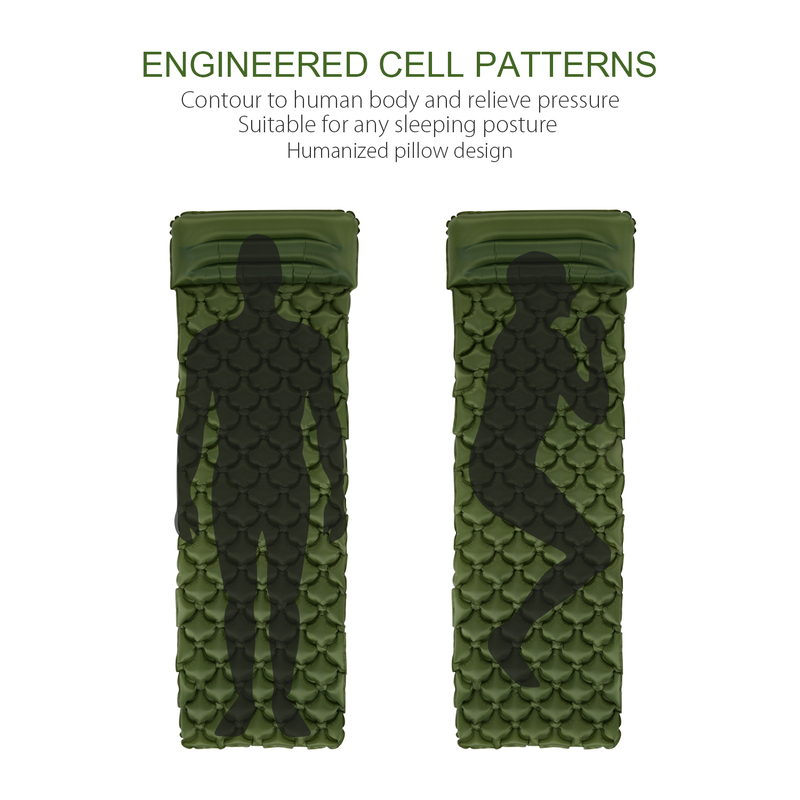 COMFORT WITH PILLOW: This sleeping bag with built-in pillow helps relieve neck stress without worry about pillow slipping away. Engineered cell patterns are designed to contour to your body and provide a balanced surface for optimal back support and comfort. No more sore back or annoying discomfort from little rocks or leafs underneath! 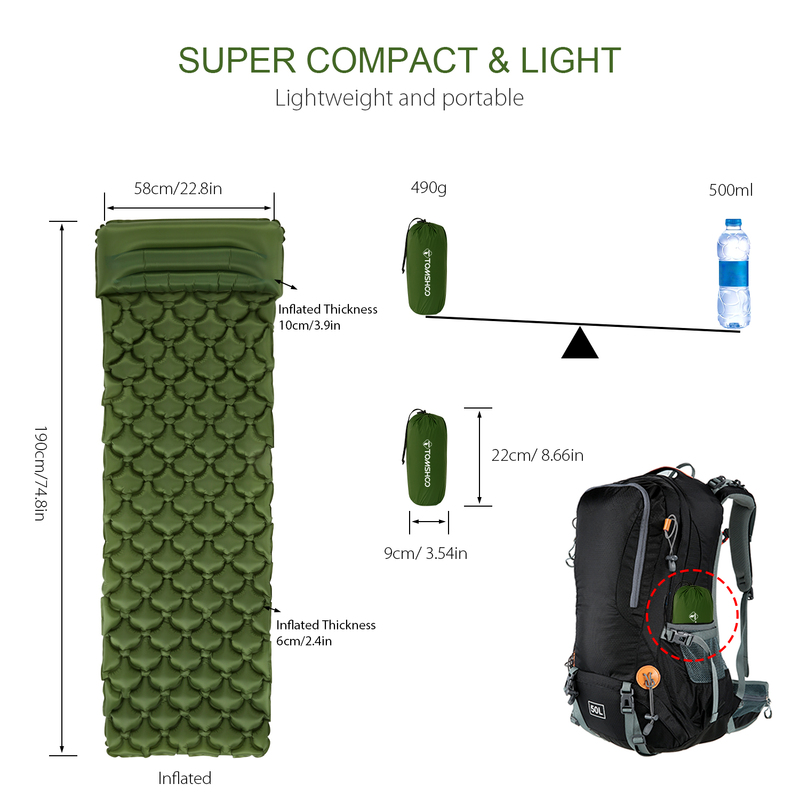 ULTRALIGHT & COMPACT: Measuring 74.8″ * 22.8″ inflated, the sleeping bag weighs only 1 pound at 8.7″ * 3.5″ after packed in the storage sack which is small enough to fit in your backpack, ideal choice for backpacking, hiking or weekend family camp-outs. Thank you very much for nice mattress! I’m very satisfied. Товар пришёл хорошо упакован в целости. Товар соответствует описанию. Товар хороший,продавец надёжный. На практике испытаю только летом, отзыв потом допишу. Спасибо ! Very easy to inflate. Item arrived quickly. Recommendations: Thickness of the product should be increased.